” Engaging with our people in a culturally sensitive way is vital and SWAMS is always looking for new and innovative ways to do this on a large TV screen in our waiting rooms. After all we service more than 10,000 clients and average 50 new patients every month. Delivering important national and local health campaign messages and promotions via a digital TV channel saves lives. We can then follow up the patients with advice, clinical options and promotional material. We know that giving patients advice in their own language assists with their understanding of their health conditions and what services they can request from our clinical team. Aboriginal Community Control even in health messaging is important and we will certainly make use of the offer to create our own unique promotional content. 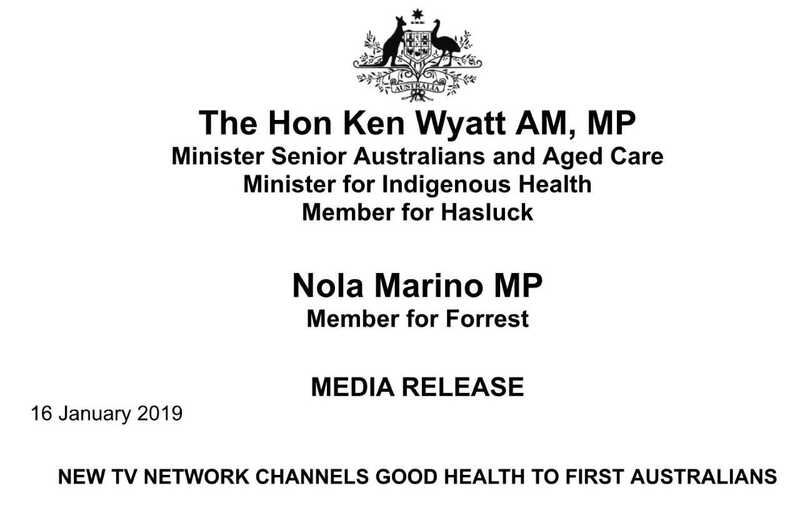 I welcome the assistance provided from NACCHO to the Aboriginal Health Television Network about our needs, expectations and hopes that this service will help thousands of patients obtain the care they deserve in our health settings and WA hospitals. 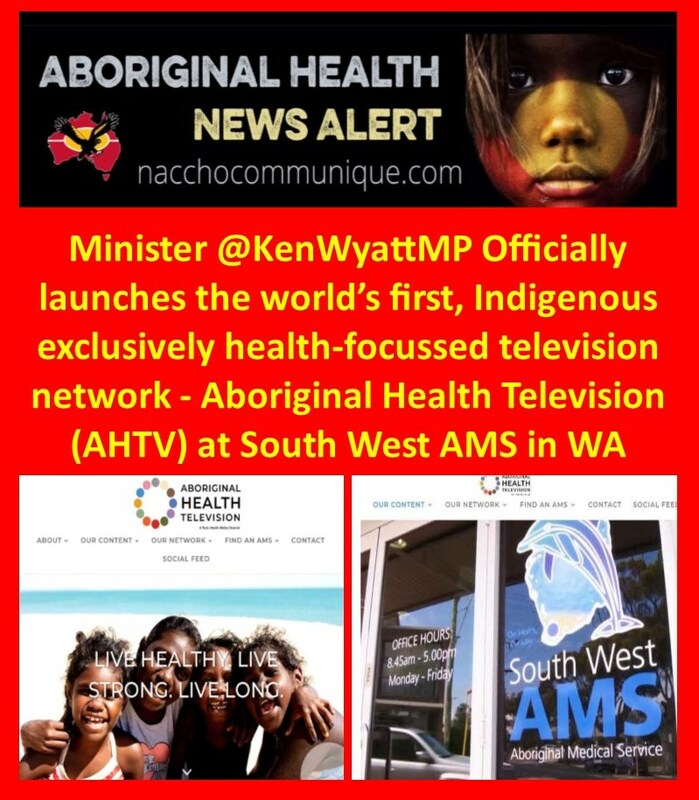 Today the world’s first, Indigenous exclusively health-focussed television network – Aboriginal Health Television (AHTV) was officially launched by the Federal Minister for Indigenous Health, the Hon. Ken Wyatt AM, MP. The Federal Government in July 2018 committed $3.4 million over three years to develop the targeted, culturally relevant AHTV network, which is expected to reach a First Nations’ audience of over 1.2 million people a month. “The fundamental idea behind AHTV is to provide engaging, appropriate and evidence informed health content to Aboriginal people while they are waiting to see their health professional,” says Dr Norman Swan, Co-Founder of Tonic Health Media who is developing this not for profit network. “We have evidence that this period in the waiting area is a time when people are most open to information which can improve their health and offer relevant questions to ask their health professional when they see them in the next few minutes. 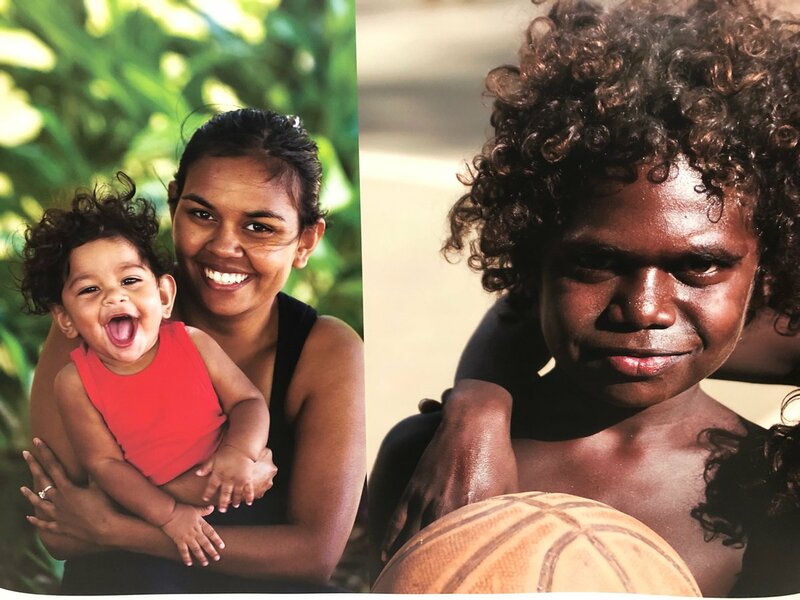 “Our aim is to offer AHTV as a free, fully maintained service to all Aboriginal Community Controlled Health Organisations (ACCHOs) across Australia – around 300 locations. And it is already being rolled out, with SWAMS as one of our first. We know that our targeted messaging can make a big difference. There’s nothing like knowledge to give people control over their decisions. “AHTV, guided by its Advisory Group of highly respected Aboriginal health leaders and researchers, will continue to work closely with Aboriginal Peak Health Bodies and ACCHOs, to develop and deliver culturally relevant health messaging and lifestyle content. “We are also partnering with third party content producers who specialise in Indigenous content to acquire and produce culturally relevant content,” Dr Norman Swan said. Tonic Managing Director Dr. Matthew Cullen says the partnership is an important step towards Tonic’s goal of improving health outcomes for all Australians. “AHTV provides a unique opportunity to communicate with Aboriginal audiences at the point of care when patients, their families, carers and health service providers are strongly focussed on health and wellbeing,” said Dr Cullen. Aboriginal Health TV Advisory Group member, Associate Professor Chris Lawrence, says the delivery of a culturally relevant TV network that connects with Aboriginal and Torres Strait Islander communities will improve health outcomes. “Australia has always been a world leader in health promotion. AHTV signals a new era in how health promotion messages are told and delivered to one of the world’s most vulnerable and at-risk populations. “AHTV builds on this using digital technology to help close the gap, and improve the health and wellbeing of Indigenous Australians,” said Associate Professor Lawrence. These sentiments were echoed by South West Aboriginal Medical Service (SWAMS) CEO Lesley Nelson who is proud that SWAMS is one of the first locations in Australia to have AHTV. “Health promotion is a huge part of what we do at SWAMS, and we welcome any opportunity to communicate these important health messages to our clients,” Ms Nelson said. “The fact that the content has been tailored to suit our local Aboriginal community means that our clients will benefit from health information that is relevant, culturally sensitive and meaningful to them. I strongly encourage Aboriginal Medical Services nation-wide to jump on board this fantastic initiative,” Ms Nelson added. Jake Thomson, a proud Aboriginal man is playing a lead role in bringing AHTV to Indigenous communities. Belonging to the Wiradjuri Nation and growing up in Western Sydney, Jake is the Community Relationships Manager for AHTV. “AHTV not only offers culturally relevant content, but it gives a voice to every community. By having the information they need, it will enable our people to consciously make the right choices, which in turn will lead to better health outcomes for Aboriginal and Torres Strait Islander people,” Jake said. And that’s exactly the aim of AHTV. Its tagline “Live Healthy. Live Long. Live Strong.” is the message they are here to deliver. 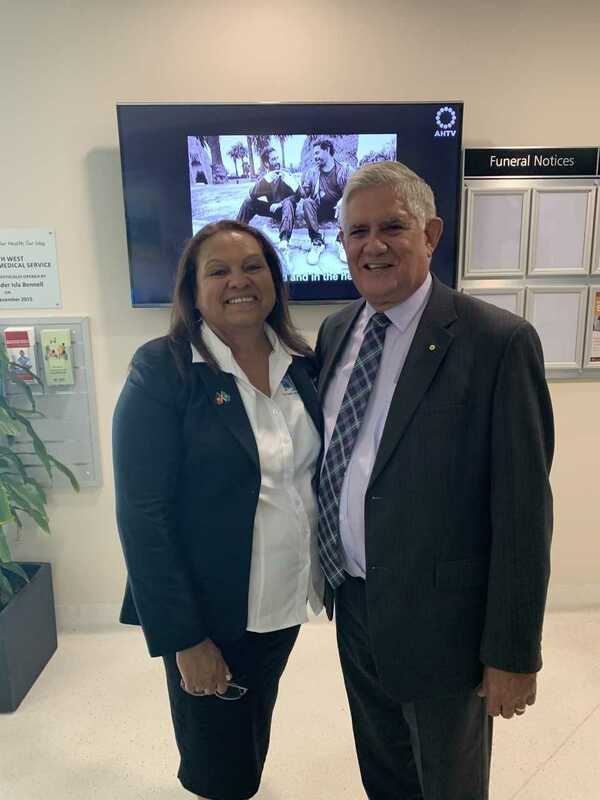 Part 2 : South West Aboriginal Medical Service (SWAMS) CEO Lesley Nelson ( and NACCHO board member ) is proud that SWAMS is one of the first locations in Australia to have AHTV. It is always a pleasure to welcome the Indigenous Health Minister to our South West Aboriginal Medical Service and staff from the Aboriginal Health Television Network. (Acknowledge any other VIPs in the audience). Minister, this world first Aboriginal Health Television Network will assist our 70 staff who are based in six clinics to discuss with our patients’ topics like diabetes, dental health, sexual health, tobacco cessation, men’s and women’s health and heart health. Engaging with our people in a culturally sensitive way is vital and SWAMS is always looking for new and innovative ways to do this on a large TV screen in our waiting rooms. After all we service more than 10,000 clients and average 50 new patients every month. Delivering important national and local health campaign messages and promotions via a digital TV channel saves lives. We can then follow up the patients with advice, clinical options and promotional material. We know that giving patients advice in their own language assists with their understanding of their health conditions and what services they can request from our clinical team. Aboriginal Community Control even in health messaging is important and we will certainly make use of the offer to create our own unique promotional content. I welcome the assistance provided from NACCHO to the Aboriginal Health Television Network about our needs, expectations and hopes that this service will help thousands of patients obtain the care they deserve in our health settings and WA hospitals. On behalf of the South West Aboriginal Medical Service and NACCHO I welcome the launch of this new world first service in our community by the Minister. 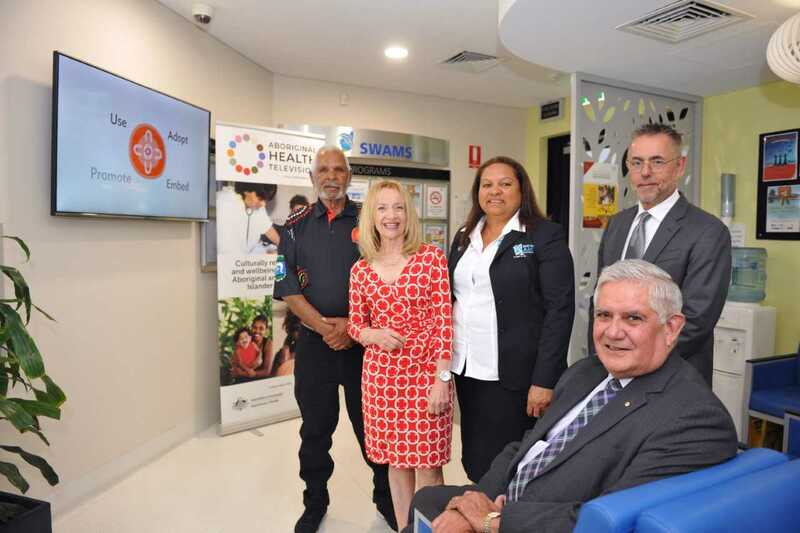 A new digital television network now rolling out across the nation aims to help Close the Gap in health equality by revolutionising the way hundreds of thousands of First Australians receive health information. Today’s official launch of the Aboriginal Health TV (AHTV) network at the South West Aboriginal Medical Service in Bunbury, Western Australia, is backed by a three-year, $3.4 million commitment by the Liberal National Government, to ensure First Australian patients can access relevant health stories and advice at local treatment centres. 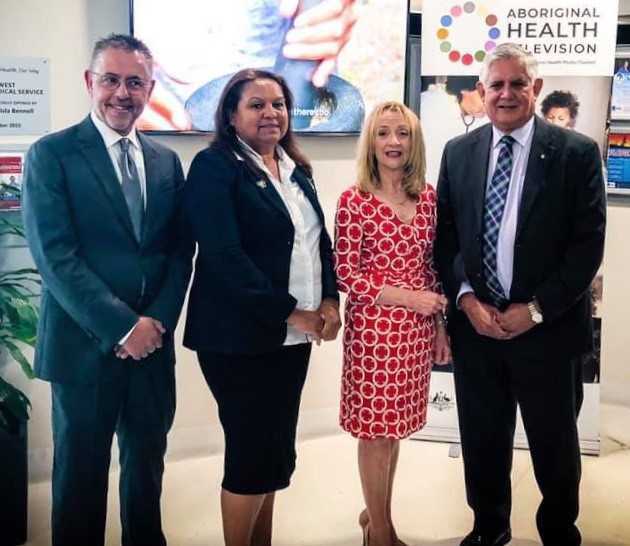 “The new network is an exciting step forward, built on local engagement, including local production of health and wellbeing stories, to reach the hearts and minds of our people and our families,” said Indigenous Health Minister Ken Wyatt AM. The TV programs will be broadcast at Aboriginal Community Controlled Health Services around Australia. Tonic Health Media (THM), the nation’s largest health and wellbeing network, is producing and commissioning targeted video content for AHTV, which is expected to be viewed by up to 1.2 million patients each month. The programs on the new digital network feature issues including smoking, eye and ear checks, skin conditions, nutrition, immunisation, sexual health, diabetes, drug and alcohol treatment services and encourage the uptake of 715 health checks. To ensure these important health messages reach as many people as possible content will also be repackaged for social media sites such as Facebook, Instagram and YouTube. “South West Aboriginal Medical Service has been chosen as one of AHTV’s initial trial sites,” said Member for Forrest Nola Marino. AHTV will be installed and maintained at no cost to local Aboriginal Community Controlled Health Services and plans to be self-sufficient within three years. “It is expected the network will be broadcasting in 100 locations by May 2019, with the overall rollout planned for approximately 300 centres nationwide,” Minister Wyatt said. Content licensing partnership agreements have been signed with ABC Indigenous and NITV and negotiations are underway with third-party production groups specialising in local Indigenous content. The Liberal National Government’s AHTV commitment is part of the $3.9 billion dedicated to improving the health of Aboriginal and Torres Strait Islander people announced in the 2018-19 Budget.